The 4-year-old Kingmambo colt Archipenko (pedigree) makes a great case for those breeders who believe an older mare can still produce a quality foal. Bound, a 1984 daughter of Nijinski II and the incomparable mare Special, was a fine runner -- a stakes winner and multiple graded stakes-placed earner of over $300,000 -- and undeniably earned her tickets to see such great sires as Forty Niner, Mr. Prospector, and Seeking the Gold, as well as Nashwan and Cox's Ridge. From those studs, she produced an above-average lot, including a minor stakes winner and another stakes placer. Bound's fillies were popular broodmare prospects when they reached the sales ring, with prices reaching over $1 million for her well-bred daughters. But it wasn't until Bound was 19 years old that she produced a foal that was graded stakes quality. Soar With Eagles, a 2003 son of Kingmambo (SRO), hasn't burned up the track, but he did score a place finish in the UAE Royal Whip Stakes (UAE-II) back in 2006, and is still in training in 2008. The real star came a year later, however. At 20, Bound foaled a full brother to Soar With Eagles, and Archipenko is now closing in on the $2 million mark in earnings at 4 years old. With graded wins in Ireland, the UAE, Hong Kong, and England, Archipenko will next tackle the Arlington Million this Saturday (full story here). What makes Archipenko special? The question answers itself: the mare Special appears 4 X 2 in his pedigree; she is both the dam of his broodmare sire (Nureyev) and his own second dam. Special, from female family 5-H, is of course full sister to the good sire Thatch, but is best known as the dam of Nureyev and granddam of Sadler's Wells. Archipenko's lineage is actually significant for its inbreeding. His dam, Bound, is bred on the same cross as Nureyev (he was Northern Dancer over Special; she was Northern Dancer's son Nijinsky II crossed with the same mare). Add in another cross of Northern Dancer's broodmare sire, Native Dancer -- who is the grandsire of Kingmambo's sire, Mr. Prospector -- and of Nasrullah -- who is both the sire of Special's broodmare sire, Nantullah, and the sire of Mr. Prospector's damsire, Nashua -- and what results is a pedigree page that has a strong pattern of inbreeding and linebreeding, capped off by a Rasmussen Factor to one of the finest mares in the last 50 years. What does it all mean? Well, I'm guessing that Archipenko will earn a working retirement in a stud barn somewhere -- based on his connections, probably not the U.S. The fact that he carries significant inbreeding and has been able to shine on the track bodes well for him (we discussed this concept back before the Derby, while looking at Big Brown). As with many turf horses, he excels at "classic" distances. His light race schedule -- he raced three times at 2, five times at 3, and another five times thus far at 4 -- would be less of a concern if he goes on to run a strong campaign for the rest of 2008 (and, dare I hope, another year or two beyond that!). The Northern Dancer and Mr. Prospector lines being fairly close up, it's likely that Seattle Slew-line mares will be a primary choice for Archipenko at stud -- giving an even stronger linebreeding to Nasrullah but allowing for a complete outcross in the five-generation pedigree. 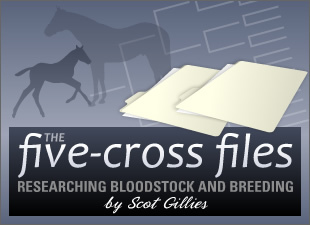 I also see opportunity for these bloodlines to work well with an outcross line such as through Relaunch or Holy Bull. In the meantime, Saturday's Arlington Million should be exciting. Archipenko will handle the 10 furlongs, will love the turf at Arlington, and will give hope to all of us breeders with older mares. Looking forward to watching something special!